Inna Steinbuka, European Studies masters’ program director at the University of Latvia, recently visited Ukraine. Ms. Steinbuka has the huge experience of holding top EU offices and directly participated in preparations for Latvia’s entry into Euro-Atlantic institutions. We began our conversation with the history of relations with Ukraine and the way she, a mathematical economist, became a European Commission official. “The history of relations with Ukraine carries me back to the Soviet era. I started my career in research and worked at the Academy of Sciences’ Institute of Economics. I maintained very good contacts in various republics, including Ukraine, for example, with Professor Valerii Heiets. Like Prof. Heiets, I focused on economic modeling and forecasting. As a mathematical economist, I dealt with mathematical models. I visited Kyiv many times. Those were, as a rule, business trips and conferences, but very warm memories about people, hospitality, and, naturally, an amazingly beautiful city have remained etched on my mind since then. Ms. Steinbuka, how come you became later a European Commission official? “At the very beginning of Latvia’s independence, I transferred from the Academy of Sciences to the Ministry of Finance, and then represented Latvia in the IMF. That was my first experience of working at an international organization. In May 2014 I took part in a competition, announced in 10 countries, for the office of a top-level executive. I applied, quite successfully, for four offices and finally began to work at the European Commission. On the other hand, I did not represent Latvia in the EC – I just won the competition as citizen with a certain qualification. The competition for one of the four positions was at least 70 and 250 at most. “I began to work at the EC in November 2005. I was a department director at Luxemburg-based Eurostat for six years. Then I moved to Latvia and held a quasi-diplomatic office. I headed the European Union’s representation in Latvia. It was mandatory for us, representation members, to know the Latvian language and, of course, to be citizens of an EU member state. “I have excellent command of the Latvian language, but I did not use it professionally in the Soviet era. I dealt with econometrics at the time. It was a narrow specialization, and this kind of specialists could be counted on the fingers of one hand. So there was no use publishing articles in Latvian. And I defended my PhD and higher doctorate dissertations in Saint Petersburg and Moscow, respectively. This is why all of my publications were in the Russian language. I read in your resume that you were awarded an Order of Three Stars, Latvia’s highest award, for economic and financial achievements. Could you explain more in detail what for? Is it perhaps about your contribution to Latvia’s admission to the EU? 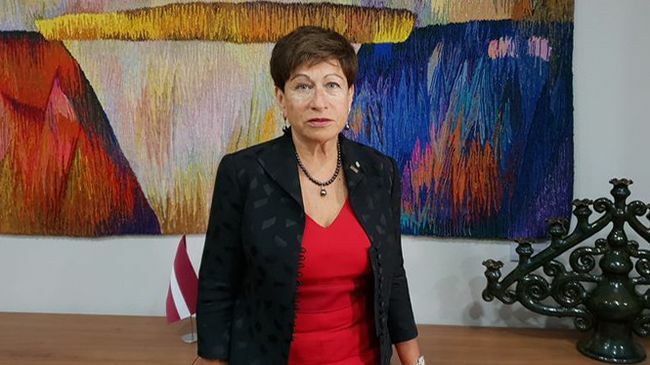 “I formed a fiscal policy department at the Ministry of Finance, managed Latvia’s first Regulator of Community Services, and contributed to Latvia’s admission to the EU. I’d like to emphasize that I am a Euro-optimist. “I have always wanted Latvia and me to be part of Europe. It was my dream. I must have been ‘blacklisted’ and was banned from traveling abroad in the Soviet era. My dream was to travel to Paris. And this dream was perhaps not only mine. This city was associated in me with the heroes of Hemingway and Remarque, and it seemed to me that traveling to Paris was the same as traveling to the Moon. “When we gained independence, I, of course, took part, within my competence, in the EU accession negotiations at the earliest stage. Latvia signed the EU Association Treaty in 1995 and joined the EU in 2004. “I’d like to draw a parallel with Ukraine: frankly speaking, if I had been asked in 1993 or 1994 whether I believed that Latvia would join the EU, I would have said that it would not happen in my lifetime but my children and grandchildren would live in the EU for sure. “My participation in the Latvia-NATO talks was confined to a purely economic expert examination. For, if a country is going to join NATO, it is important not only to observe certain legislative, legal, military, and strategic conditions and criteria. There should be certain objective guarantees that the country will go on developing steadily. For steady economic development is also, to some extent, a guarantee of political stability. Incidentally, did the Latvian government or society show any hesitation about joining the EU and NATO? “Indeed, there were hesitations, especially on the very eve of the entry. Latvia held a referendum, and pro-Russian forces spread vicious anti-European propaganda. Ms. Steinbuka, I noticed on your Twitter page that you took part in the debate “Are European Values Universal?” on September 4. I wonder why such debates emerge in Europe. “It’s no secret that Europe has been subjected to biting criticism lately. Criticism can be positive. We ourselves can criticize Europe for not doing something the way we want. And we are doing so in an attempt to help improve Europe. On the other hand, there is such thing as propagandistic criticism, disinformation, and fake news. “Such fundamental values of Europe as freedom of speech, the right of man to life and self-expression, freedom of movement, democracy, democratic elections, and rule of law are being called into question. I am naming fundamental things which some political forces in Europe and, first of all, aggressive propagandists in Russia are calling into question. “The EU is, above all, a peacekeeping project. My generation has not known war. But the sensation of war was handed down through the memory of parents. The younger generation cannot always be aware of the ravages of war and the EU’s contribution to the cause of peace. Besides, we have the experience of living in the Soviet Union, where there was no democracy or freedoms. And the next generation does not know what the absence of freedoms and the existence of borders mean in practice, when you can’t travel freely to a foreign country. And when they read some crowd-pleasing or propagandistic statements, many of them believe these. But you can also see different tendencies in Europe and even the US, when some voters want to have a strong leader who will address their problems. What will you say to this? “This shows that people doubt the efficiency of the system and begin to seek an alternative. Not all remember, know, or take interest in history. Meanwhile, the historical examples of some strong personalities vividly show what this can lead to – to Stalinism, Hitler, or even Ivan the Terrible. “For this reason, humankind can invent nothing new. There is either a democracy or a dictatorship – without any alternative. In my opinion, even a weak democracy is much better than a strong dictatorship. “We must not bury Europe prematurely. All is not so bad. For example, a year ago we were worried very much over the results of elections in France and Germany. This all occurred after the Brexit, and there was really some uncertainty. It seemed at the moment that there might be a collapse. But people proved to be wiser than the gloomiest pessimists. “On the other hand, populism can be different – it is important that no xenophobic and racist sentiments develop in society. And how should we counter this? How is Latvia struggling with Russian propaganda, for a lot of Russian TV channels broadcast to your country? And what about introducing school subjects that will teach the younger generation to distinguish between true and fake news? “There is an organization, NATO Stratcom, in Latvia, which in fact exposes fakes and furnishes information to the Alliance member states. We also have serious analytical journalists who expose fake news. “But I am against counterpropaganda. We, the EU, must not look like a dictatorial regime, for this will only discredit us. “I think an individual can only be taught to see through fake news if he or she has been taught to think critically since their childhood. All that one can see or hear must be put through the prism of critical appraisal.